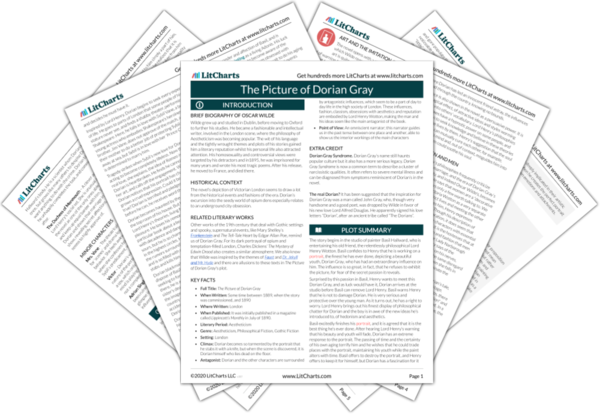 Instant downloads of all 942 LitChart PDFs (including The Picture of Dorian Gray). 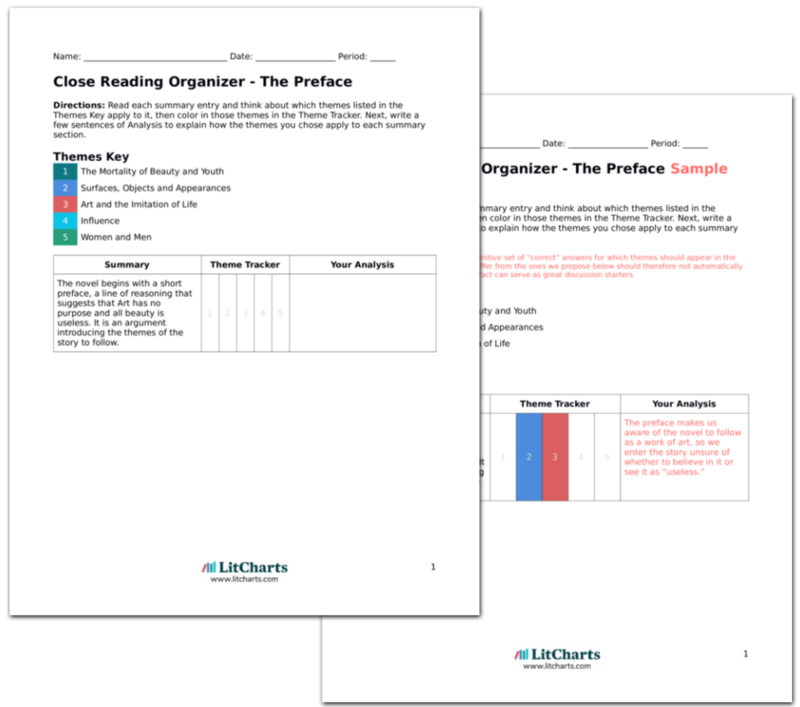 LitCharts assigns a color and icon to each theme in The Picture of Dorian Gray, which you can use to track the themes throughout the work. The cab arrives at the river side, where dark public houses and mist from the water create a secretive scene. Dorian remembers Henry’s advice to cure the soul with the senses, and has come to the home of London’s opium dens to try and force away his memories. Reflecting on his sins, he realizes that forgiveness is impossible, but he can still forget. Here for the first time—in this awful part of town, with its poverty and fog—Dorian explicitly wishes he could undo his past, that the experiences and pleasures were not worth the damage to his soul or to others. But having no means for forgiveness (and if he could still believe in religion he might feel there was some means for forgiveness) all he can try to do is forget. Through the foggy, riverside slums, the cab seems to be crawling. Dorian can’t wait to satisfy his craving, and his mind is mad with paranoia and imaginings. He contemplates the changes in him: his taste is now for the ugliest of pastimes. He sees filth and desire as beautiful temptations. He doesn’t long to be good, only to forget and feed his sins. Dorian’s addicted, obsessive mind now transforms everything of life into a strange, slow-motion show. Just like the book about the Parisian gentleman, the story of his life revolves around him and his sins. Henry’s advice that beauty is not innocence but experience, has overtaken his perception of the world around him. The opium den is full of old, poor objects and sick looking people. Dorian goes straight towards a figure in the shadows and follows it up some stairs and along a dark corridor. The air becomes thick with the smell of opium. The vision of the opium den, ugly and unclear, is the opposite of Dorian’s luxurious home and youthful face. Here we see his life represented as it really is – the hideous portrait would be quite at home here. When inside the room at the end, Dorian sees an old friend, Adrian. Adrian says that he has been shunned by his old acquaintances. Opium is the only friend he needs now. Dorian observes fearfully the deformed figures sitting around them, each in a state of the forgetfulness that Adrian describes. The memory of Basil haunts Dorian. And so does the presence of his changed old friend. Dorian wants to be somewhere where he can be anonymous. As he leaves the broken Adrian, he is cursed by some rough old women in the shadows. They use his old nickname Prince Charming. The degradation and darkness of the bar shows us how Dorian has banished the consequences of his selfish, sensuous life to the outskirts of society. Though Basil’s is the only murder he has committed, the implication is that Adrian was brought to his sad state by Dorian's influence, and that there are many others whose lives have been essentially corrupted by him. Dorian still looks just as he did when he was Prince Charming to Sybil, but the words have turned from a statement of love to a curse. 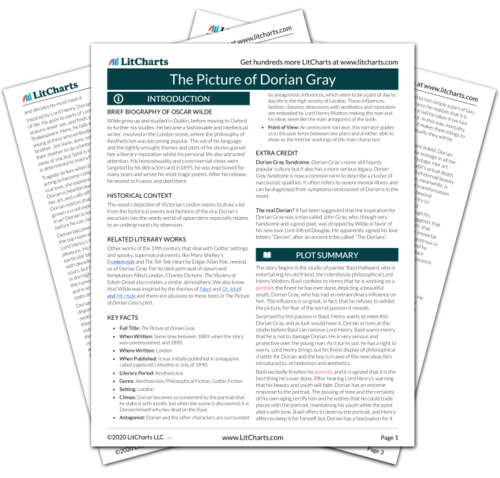 Get the entire The Picture of Dorian Gray LitChart as a printable PDF. Little does Dorian know he is being followed by a sailor. He hurries along the quay towards another den, annoyed by his meeting with Adrian and fuelled by his mad desire for sin. As Dorian turns in to another establishment, he is seized by the sailor, who with one strong hand holds him by the throat and with the other threatens him with a revolver. The image of Dorian Gray, its elevation above the shadowy figures in the opium den, is brought crashing down to earth. The focus is suddenly on Dorian’s vulnerable flesh, and we remember that he is not a myth but a real human body. The sailor announces himself as the brother of Sybil Vane and accuses Dorian of being the man who ruined her. He tells Dorian to pray to his God. Dorian rushes to deny the accusation, trying to think on his feet as James Vane orders him to kneel down. Suddenly it comes to him. He asks Jim how long ago his sister died. Jim sees that the face before him cannot possibly be eighteen years older than Sybil’s former fiancé. Dorian’s youth is obvious and Jim apologetically releases him. In trying to forget his past, Dorian has brought it's repercussions on himself. As he comes close to realizing his own mortality, in the hands of rough, unattractive Jim Vane, the triumph of art and beauty over life seems a shallow motto. Yet, Dorian’s youth wins out again. Fortune and appearance is again on his side, for now. Dorian condescends to him to be careful of his temper. As Jim walks off, a woman from the bar wonders why he hasn’t taken the opportunity to kill the man. Jim explains, but the woman responds that Dorian really is ridiculously young looking. The rumor goes that he has sold his soul for his looks. Jim runs after him but it is too late. Reputation and myth follow Dorian around these dark places. It is now not his beauty that distinguishes him but the unlikeliness of his beauty. Rumor has created another surface of Dorian Gray. His face both saves and dooms him. Parfitt, Georgina. "The Picture of Dorian Gray Chapter 16." LitCharts. LitCharts LLC, 17 Sep 2013. Web. 18 Mar 2019. Parfitt, Georgina. "The Picture of Dorian Gray Chapter 16." LitCharts LLC, September 17, 2013. Retrieved March 18, 2019. https://www.litcharts.com/lit/the-picture-of-dorian-gray/chapter-16.